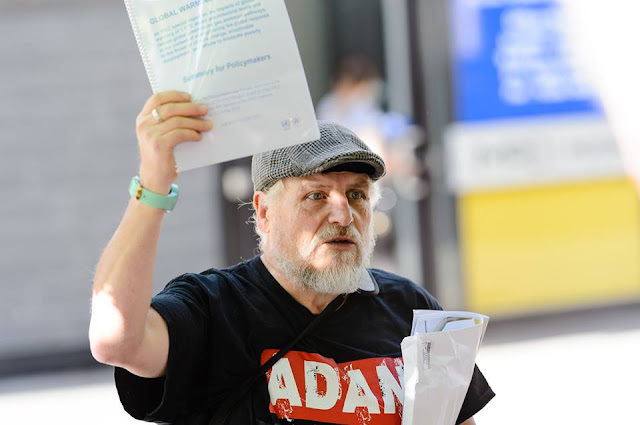 In this photo I am making a short speech outside Labor MP and Opposition leader Bill Shorten's office at Moonee Ponds on the major transformation necessary if we are to meet the 1.5C Paris climate target, as detailed by the recent IPCC 1.5C report (which I am holding up in the air). The climate science report says unequivocally that there is no physical or chemical impediment to us limiting climate change warming to 1.5C, the problems are entirely political and would entail at this stage massive social transformation of our energy, transport, agriculture and social systems. We have at most perhaps another decade to start significantly on the path of this social transformation. Actually, I think we need to be well on the path to deep decarbonisation by 2020. If we do not, the climate impacts will escalate, the impacts to health, biodiversity, ecosystems, and human mortality will increase. The greater the temperature rise, the more likely we will pass tipping points in the climate system which will further escalate and accelerate global warming leading to a 'hothouse earth' scenario. We are borrowing from our children's future. We need to rapidly decarbonise our ways of living, whether through harnessing renewables, public transport, walking and cycling, or reducing waste. For renewable energy, why stop at 100%, we are such a sunny windy country let's go 200% and incorporate pumped hydro & battery storage and hydrogen generation, and become an energy exporter via renewables hydrogen economy (ammonia can be used for export). I brought up the IEEFA report just released on New South Wales Thermal Coal Exports Face Permanent Decline: Grim Outlook Prompts the Need for a Planned Transition, examines the status of NSW coal export destinations. Bill Shorten and the Labor Caucus need to be looking at structural adjustment just transition programs for the export coal sector. Labor's present climate p9olicy is totally silent on applying jusrt transition to the phaseout of export coal. We have such a huge job, but it starts with each individual and their actions and their advocacy. Write a letter to your state or Federal MP and make sure they hear from you and know that they need to make the policy decisions to safeguard a safe climate for our children's future. Ask them to read the IPCC 1.5C report Summary for Policymakers (PDF) Every decision they make from here on should be made in the light of the science contained in this report. This is a summary of the science that has been vetted and agreed to by Government representatives on the IPCC, so it is inherently more conservative than the full scientific technical report that it is based upon.